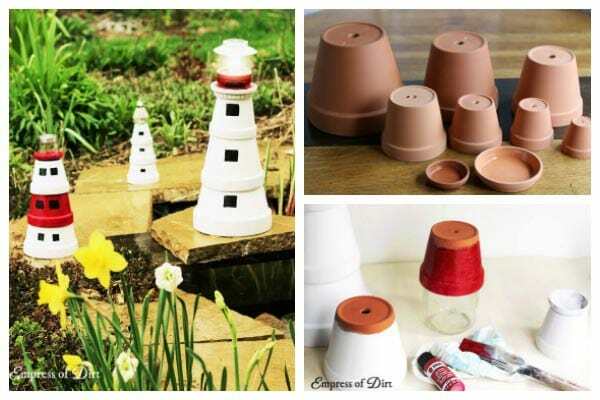 These clay pot lighthouses are an easy craft project to make with kids and can be completed in an afternoon (plus paint drying time). A solar lamp on top makes them glow at night—it’s very pretty! 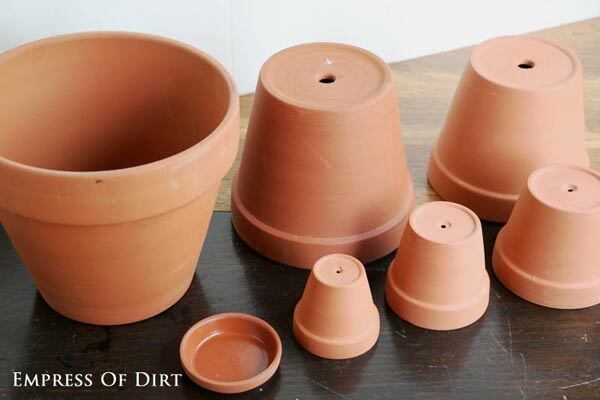 If you would like more garden art project ideas, also see Creative Projects to Make with Clay Pots. 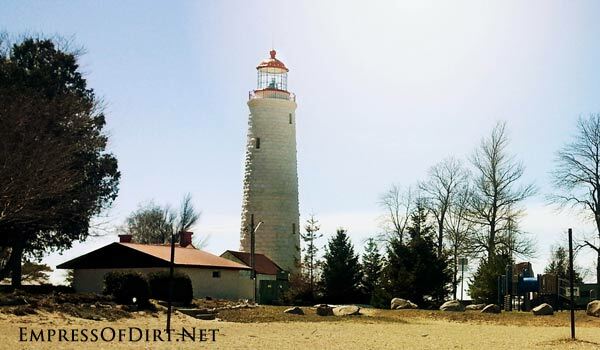 When we visited this old lighthouse at Point Clark, Ontario on Lake Huron, it was under renovations. The first time we visited years ago, we happened to arrive on a magical day when a massive migration of monarch butterflies was there. I’ll never forget how amazing it was to have thousands and thousands of butterflies flitting all around us on the beach. To commemorate this favourite place and my love of lighthouses, I decided to create my own souvenir based on this one. 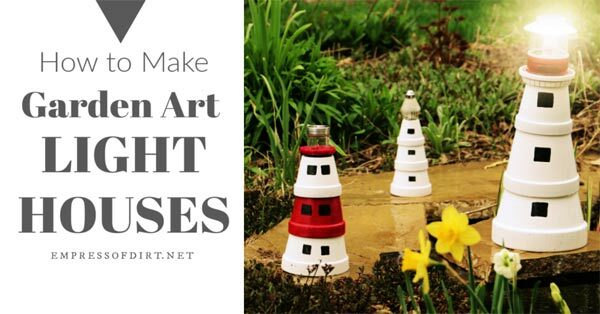 If you have a favourite lighthouse, you may want to work from a photo and pick out the key elements that make it unique. This one is basically a white tower with the lamp at the top, a few small windows, and some red trim. Since I’m not trying to build a replica but instead just want a simplified version of the lighthouse, I didn’t fuss over details. TIP: If you’re reusing flower pots, be sure to wash and dry them thoroughly first. This will allow the paint to adhere properly. 1. Clay pots (3 or 4). You will need various sizes ranging from small to large (one of each size). They will be stacked upside-down to form the lighthouse. 2. Clay saucer (1). This is used as the top deck that the lamp sits on. I used a saucer that fit one of the smallest pots. 3. Lamp (1). 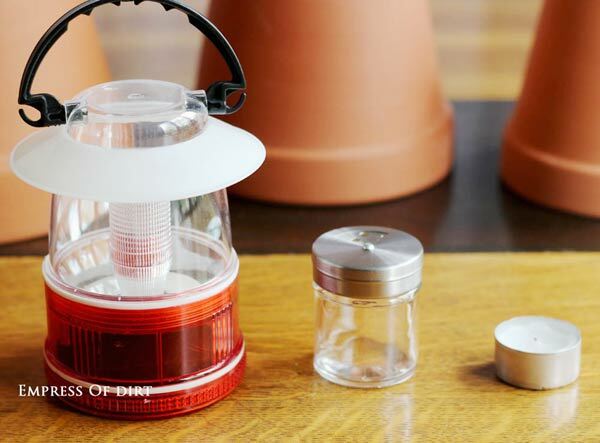 You could use a small solar patio light, battery-operated lantern, or a votive candle (for patio use). Whatever you choose, be sure it is the right size to fit on top of your lighthouse. For my smallest lighthouse, I used an old salt shaker instead of a lamp. 4. All-purpose primer. This makes the paint adhere better to the pots. 5. Outdoor patio craft paints You can see the ones I use here on Amazon.com. I used black, red, and white. 6. Adhesive to glue the pots together. I use GE Silicone II outdoor, waterproof clear-drying sealant. You could also use a product like E6000. 7. Polyurethane or equivalent sealant (to protect the paint). 8. Paint brushes, rags, gloves, clean up supplies. 10. Paint Pen (black-optional) for adding decorative details. 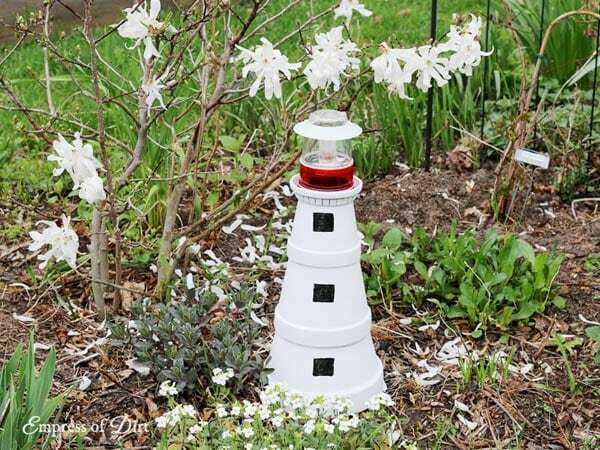 As mentioned in the supply list, if you want the lighthouse to really light up, you could use patio solar light units, a battery-operated lamp, or a votive candle (for supervised use on a patio). Alternately, if you don’t want a working light, use an old salt shaker or something similar for the spotlight. You might just have the perfect item sitting in your cupboard. Be sure to do a dry assembly of your lighthouse first to make sure everything fits nicely. Also, keep track of the pieces so you know what’s what. See how the pots overlap in the photo? Mark those spots with a few small pencil lines. You won’t need to paint the hidden areas. Next, decide on a design and colours. You can copy what I have done here or look up pictures of lighthouses (try a Google image search) and choose something you love. It may be helpful to draw a diagram. I kept mine really simple. EEK! Ghosts! Okay, not really. When the paint is dry, set up your lighthouse to decide the best placement of the windows (and a door if you want to add one). 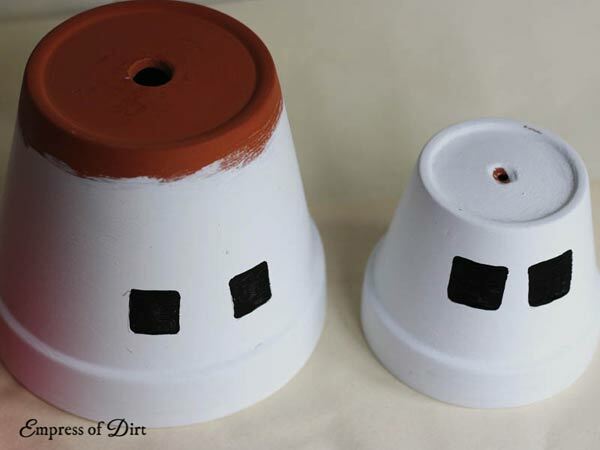 I made window templates out of cardstock, traced the shape onto the pots, and painted them black. The final step is to attach everything together with adhesive. 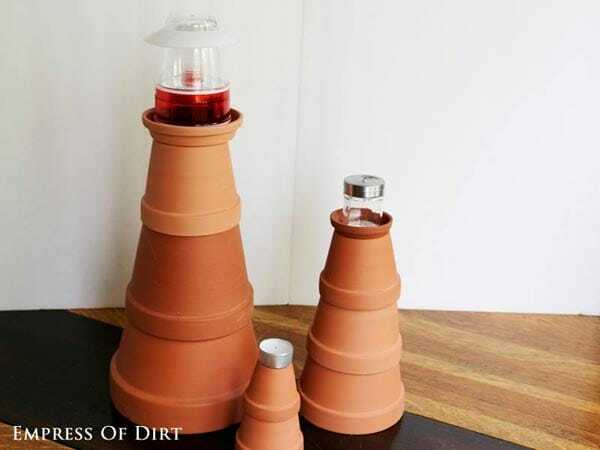 You’ll want to be sure the pots stay snug together, plus the saucer should be secure on top, holding the lamp in place. If you’re using a lamp that requires batteries, don’t attach it (because you’ll need to be able to change the batteries). Finally, add a few coats of polyurethane (or an equivalent protective product) to the painted surfaces. Follow the directions on the product label and allow everything to dry thoroughly between coats. 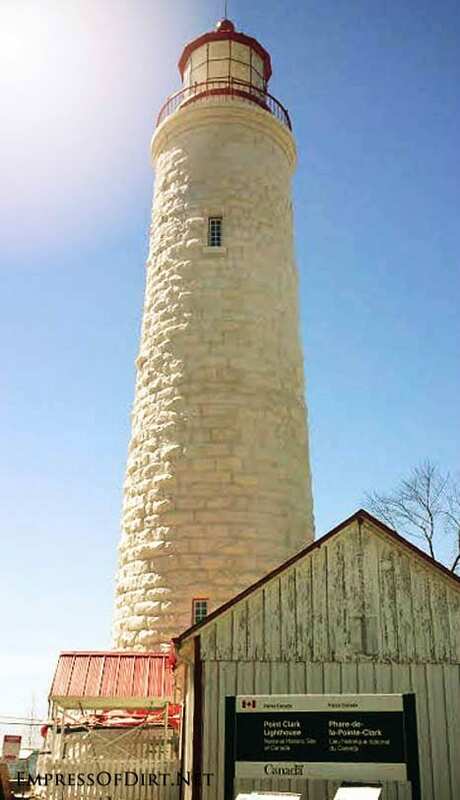 Now your lighthouse is ready to be displayed. It looks really pretty when several of them are lighting up the evening garden. It’s a fun project to complete in an afternoon. 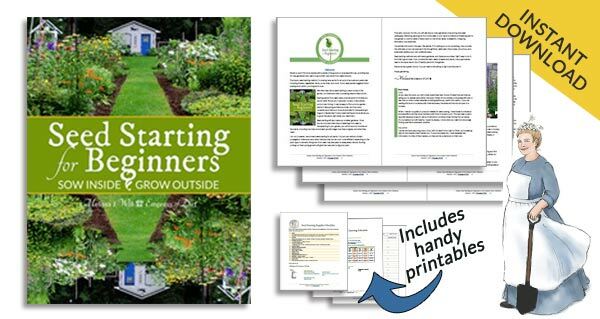 And don’t forget to sign up for the free Empress of Dirt newsletter for more creative garden ideas. 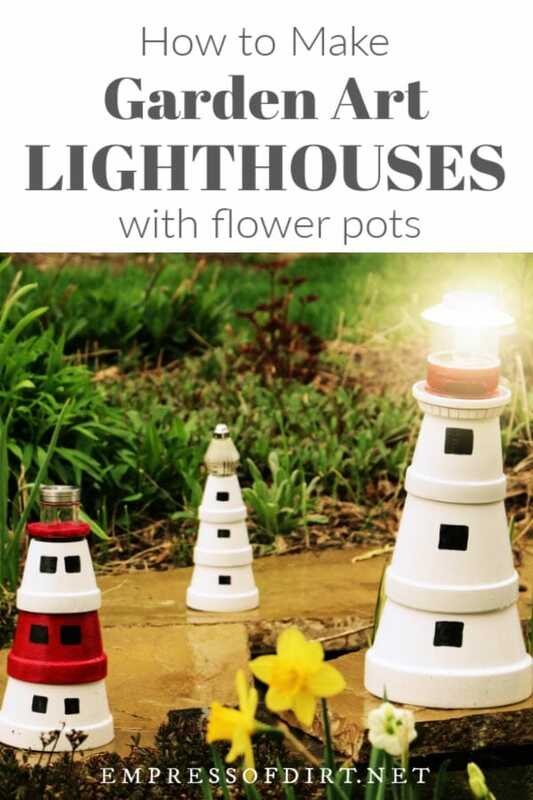 I can’t wait to try this ,the light houses or so cute. 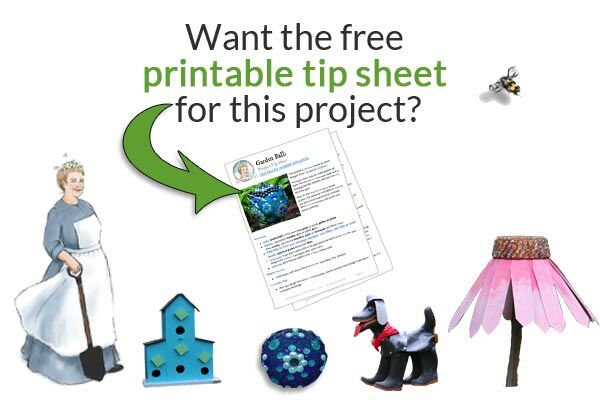 The children would love making theses. It is fun and easy for kids. Thanks, Judy! These are so cute, some people just have a lot of vision for things,you are a wonder, Thanks Melissa. You’re very kind, Marlene. Thank you.